"The greenest fields lie furthest away." 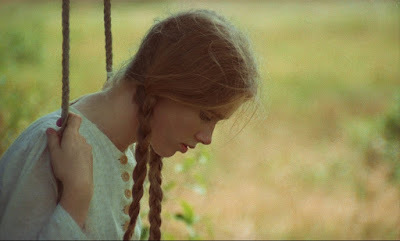 This is going to sound facetious, but it’s apt: Swedish director Jan Troell’s 1971/72 dual-header is essentially what we’d get if Werner Herzog were hired to direct The Lord of the Rings. Two very long (3 hours and up!) interconnected movies, neither of which is entire unto itself, detailing a long trek through unforgiving nature and an impossible but worthy goal. No magic, no fantasy, no indulgent effects showpieces; rather, harsh living, insurmountable odds, and an indifferent universe all plotting against people banded together to get from one end of the globe to the other. Based on a book by Vilhelm Moberg, this ambitious adaptation by Troell (Everlasting Moments [review]) follows the Nilsson clan in the mid-19th Century as they pull up stakes in Sweden and head for America in search of the myth of a better life they’ve read about in newspapers and pamphlets. The journey begins with The Emigrants, which is essentially the events leading up to their decision to leave, their trip across the ocean, and then their further delving deep into the American heartland, destination Minnesota, to lay new stakes in the New World. Once they get there, the film is done, and what happens next is for the concluding volume. 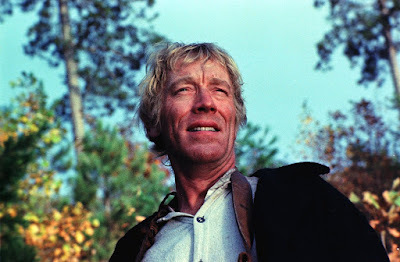 Max von Sydow (The Seventh Seal [review]) leads the cast as Karl Oskar, a farmer who can’t catch a break. One year the snow kills his crops, the next year a heat wave. He is married to Kristina (Liv Ullmann, Autumn Sonata [review]), and together they have three children--though that number will shift as the story carries on, both regressing and progressing. Fed up with what he considers cursed soil, Karl Oskar plots with his younger brother, Robert (Eddie Axberg, My Life as a Dog [review]), a slow-witted farmhand, to make the move. Though, as Karl Oskar is warned, once he has decided on this journey, he will discover he has far more relatives than he had previously realized. Kristina’s uncle Danjel (Allan Edwall, Fanny and Alexander [review]) has been leading his own Christian congregation, one separate from the dominant church, and he and his followers have been persecuted for it. He wants to go along and bring the faithful with him. So it is that a rather healthy-sized group sets off to sail the Atlantic for a better tomorrow. The build-up comprises the first third of The Emigrants, and the sailing the second. 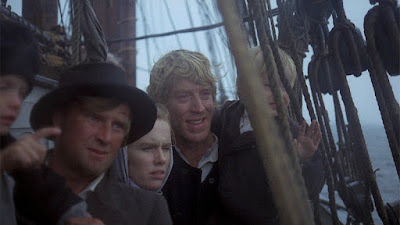 Unsurprisingly, the passage the Nilssons can afford is not the best, and they are crammed into the hull of a ship with little food and no real ability to cope with the seas and disease. A much smaller group lands on the American shore, and the final third of the film goes along with them as they head by train and river for Minnesota, seemingly finding what they have been looking for. 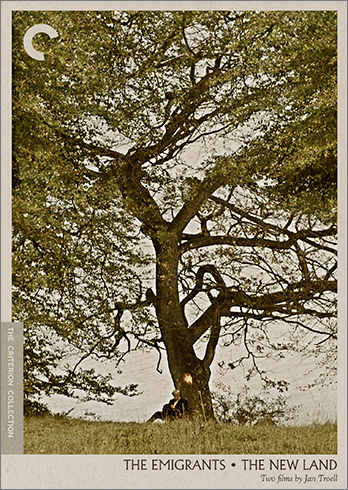 Troell is content to let the story roll at its own pace, and his presentation is unadorned and naturalistic. Conditions are severe, and we feel the drudgery and the disappointment as things grow progressively more difficult and take more time. The nausea that dominates the ocean voyage practically comes through the screen. Try not to feel a little green around the gills yourself. Troell wants to re-create the time with a rigorous and exacting attention to detail, down to the small talk and diversions. The only bits that don’t come across as believable are the hairstyles, which change not at all over a 10-week voyage, and some of the American accents of the people they encounter upon landing. But those are pretty insignificant nits to pick. 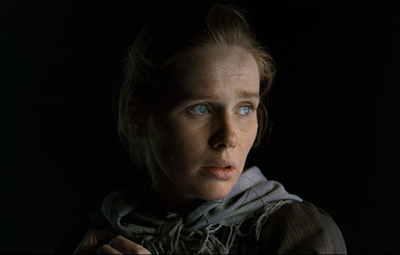 Unsurprisingly, The Emigrants can be a bit of a struggle to watch, but not an unrewarding one. Though the pacing is slow, Troell packs the script, which he co-wrote with Bengt Forslund, his collaborator on Here is Your Life, with plenty of personal conflict, be it the difficulties of marriage or the clash of ideas, as opposing views of religion and rational thought criss-cross within the group. (In one excellent moment of ironic piety, we discover a reformed wanton woman (Monica Zetterlund) has gained the honest to goodness moral high ground without remotely tempering her personality.) These are brought to life by a fine cast, with the expected exceptional performances by von Sydow and Ullmann. He plays Karl Oskar as a man tripped-up by his own vanity (the American will is strong in this one!) but who generally wants to do what is right; she gives Kristina a foundation of concern and compassion, tempering her motherly instincts with a practicality her husband sometimes lacks. He is the dreamer, and she is the one who often has to find each dream’s shape. So, strap in when you have a full night ahead of you, and maybe prepare to take a break when the intermission pops up midway through each feature. For as much as a commitment as these two can be, when you get to the end of The Emigrants, you’ll want to know what happens next.